Brookside Estate is one of a kind! Built in 1968 from local materials including wood from Barber Dam & marble from the Capitol! Solid rock & steel construction w/2 kitchens, guest apartment, sauna, 3-fireplaces, huge bar & indoor water fall! Exquisitely landscaped w/3000 sq.ft. 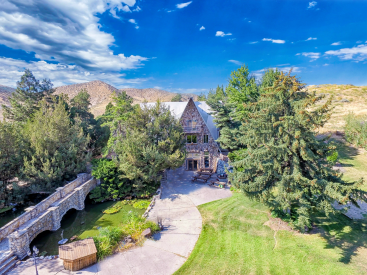 greenhouse, geothermal ponds, gravity fed sprinklers, walking paths, artesian well, 90 car parking, 3-phase power, gazebo stage, stunning rock bridge, 4000 sq.ft redwood deck w/views...potential for winery/restaurant/event center.